As Hurricane Michael tears breaks records with its landfall and march across parts of the Southeastern US, the team of the EU-funded ODYSSEA project has begun analysing how the platform and its systems performed during the progression of Mediterranean Cyclone Zorbas across parts of Greece. “We are following the initiation, evolution and forecast of the Med mega-cyclone Zorbas using the ODYSSEA Platform. The platform is yet at pilot stage. When operational the user will be able to combine meteo, hydrographic and oceanographic data (and many more) as produced from satellites, models and sensors at sea,” explained ODYSSEA project coordinator Prof. Georgios Sylaios of the Democritus University of Thrace (DUTH). ODYSSEA platform will allow users from marine and maritime sectors as fisheries, navigation, mariculture, oil and gas exploitation, etc. to follow forecasts on weather and marine conditions, especially useful during the outburst of extreme events. 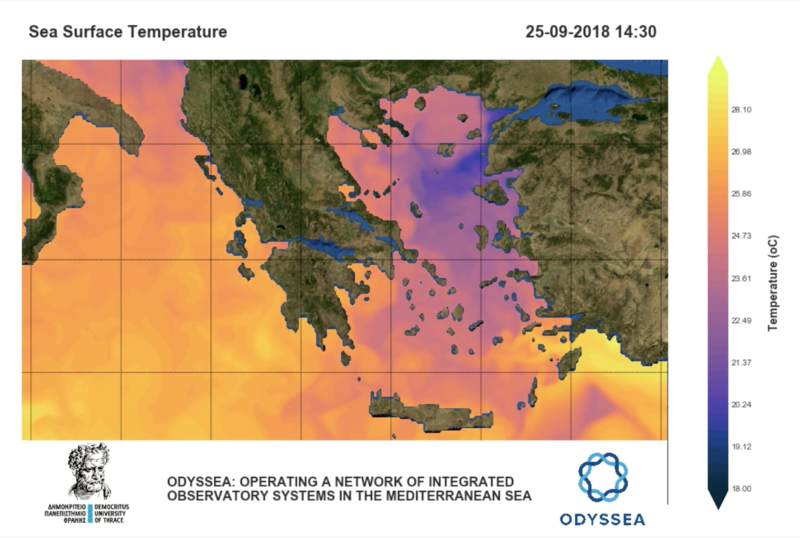 Sylaios noted that ODYSSEA is aggregating data from CMEMS, NOAA, ERDDAP, MonGOOS and other sources to provide accurate information on marine conditions, and publicising them via ODYSSEA-Greece. This included short videos showing the change of wind speed, sea surface temperature, salinity, surface chlorophyll and currents during the cyclone’s onslaught. A snapshot of Sea Surface Temperature during the progression of Mediterranean Cyclone Zorbas across parts of Greece.